If you’ve ever suffered from Lateral Epicondylitis (aka “Tennis Elbow”), you’ve no doubt been frustrated by this condition’s tendency to linger. 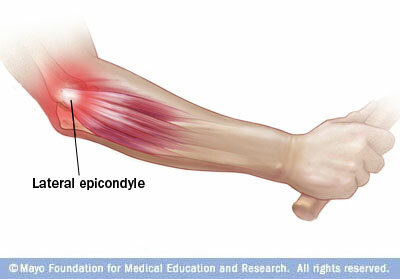 Tennis elbow is an over-use injury to the tendon of the forearm. It tends to flair up as you age and stubbornly attempt to fight the aging process by living an active lifestyle. Like many, when tennis elbow first appeared, I decided to fight through it with Ibuprofen, an arm brace and icing it down after playing tennis and exercising. Like most, this approach only caused the condition to worsen over time. After six months of increasing pain and decreased functionality, I decided to see an Orthopedic surgeon to seek treatment. I was given a rehab protocol, a wrist and arm brace and a topical anti-inflammatory (Voltaren). I was advised to stop playing tennis, doing upper body exercise and allow for recovery. Thirty days later, I followed up with the doctor after having made the condition worse by playing my final two singles tennis matches of the season. I lost the last match due to the pain. The Doctor wanted to do an MRI as the next step. At this point, I opted out of his process and vowed to myself to really stop using the arm. From here, I ventured into the world of acupuncture, cupping, massage and electrical stimulation of the affected tendon. These definitely helped loosen up my very tight muscles and provided very temporary relief. The tightness, it seemed, was contributing to the condition. I stopped this approach after a few weeks because I found it increasingly painful to reach back every other day to get my wallet from my pocket and pull out my credit card to pay for the treatments. 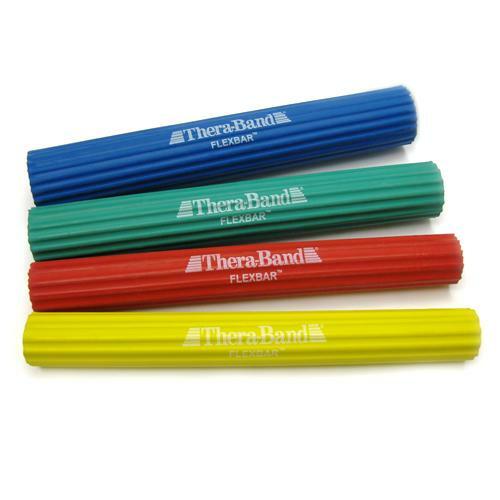 Then a friend and fellow tennis player introduced me to the Thera-band Flexbar and the Tyler Twist rehab protocol for tennis elbow. He swore by it. He said it cured him after having been similarly frustrated in his attempts to beat the condition. So I looked it up on Amazon and the customer reviews were substantially all similarly evangelical in nature. A mere $16 investment, I purchased the green flexbar (women and those with intense pain may want to start with a yellow or red Flexbar). What did I have to lose? New York physical therapist Tim Tyler developed and researched the “Tyler Twist” exercise with the Thera-Band Flexbar for his patients with lateral epicondylitis, or “tennis elbow.” The exercise was so effective that he terminated the clinical trial because the test subjects were improving so quickly over the control group of patients. The Tyler Twist rehab protocol is pretty straightforward, but best understood when viewed via video. The protocol has also received positive reviews in The New York Times, NPR, and The North American Journal of Sports Physical Therapy. The theory is that this works because the Tyler Twist causes an eccentric contraction (movements that cause muscle to contract while it lengthens) of the wrist extensor muscles on the injured forearm. And the lengthening under contraction helps break down scar tissue in the tendon at the elbow. How’s it been working for me? Well, as I write this, I’ve completed three weeks of the Tyler Twist, 15 reps, 3x/day with the green Flexbar. I has also been using the Flex bar as a little foam roller. I place the Flexbar at forearm/elbows height in a door jamb and then lean hard into it, finding the tight trigger points in my forearm, biceps and lower triceps. I have had good success foam rolling my legs, but was never able to get enough weight onto the arm to get any benefits. But using my body weight on the Flexbar in a door jam has been extremely effective. I was shocked to feel how much my tight triceps were contributing to he elbow pain. Three weeks in, the tennis elbow is still there. But the condition has improved. The stabbing pain is now a general dull ache And there is no pain when I press directly on the spot where the tendon joins the elbow bone. This is good progress and gives me hope that I will beat this and return to upper body exercises and tennis in several more months. I’ll update this post to let the reader know if this trend continues. December 2012 – January 2013: Rest between 90 day exercise rounds and between tennis seasons. January – April 2013: Resume with a new P90X/X2 Hybrid and doubles and singles tennis leagues. As the season progresses, ability to perform pull ups and curls diminishes. pain increases and persists after activity. Stop doing pull ups, start using a band instead. Also, I dramatically reduce weights on upper body exercises, and eliminate several moves altogether. Advil and strap are insufficient to alleviate. April 1, 2013: I relent and see ortho doctor. Leave with rehab protocol, and elbow and wrist brace. I also continue to play my final tennis matches, losing my last match on April 15th, due entirely to pain. On April 15th, tennis stops. Proceed with rehab efforts, acupuncture, cupping, electro-stimulation treatments, foam rolling and Tyler Twist with Theraband Flexbar. April 30, 2013: Followup with doctor. No progress. May – July 2013: Continue with rehab efforts, Flexbar. Add in Tai Cheng. July 2013: Follow-up with Doctor. After three months of not doing pull ups, pushups, curls or playing tennis, I report very slight improvement. It only hurts when I use it, lifting or pulling things with arm extended. Coffee cup, pouring coffee, etc. does not hurt. It does hurt, however, when pressing on the affected area. An MRI is scheduled. The results confirm a tear. I receive a cortisone shot on July 18th. As of July 23rd, the pain in the elbow at the point of the injection has subsided. And the elbow is feeling pretty good. September 2013: Now 5 months since I succumbed to the pain and started following the doctor’s advice, I had another follow-up with the doctor. He says I’m about 85% healed. We will continue to treat conservatively. This means he will see me every 6 weeks and charge me $200 for 5 minutes of his time. He said I should continue to rest it, and ice as needed. I then went out and played my first tennis match in 5 months that evening. This was, of course, stupid. The match was lost. The arm performed weakly and slightly achy with increased stiffness and discomfort the next day. Despite this minor deviation, the elbow does continue to improve, very gradually, with the passing of time. At this point, there is a mild ache and some clicking when the elbow is contracted from time to time. Pulling and lifting with the arm in full extension is still weak. Pushing is not a problem. Since pushing has presented no problems lately, in the past week I’ve begun to introduce 3 sets of 5-8 med ball push ups into my Tai Cheng regimen. I haven’t been using the Flexbar for the past month, mostly because I was traveling and backpacking. To be honest, just letting the arm rest seems to be having the best effect. October 2013: I would estimate at this point that I’m about 90% healed. I am able to do more with less discomfort. In my Tai Cheng warm up regimen, I am now alternating days with 3 sets of 10 med ball push ups and dumbbell presses. I’ve started using the Flexbar again and will also employ the stretching detailed at http://www.tennisarm.ch/. Still no tennis, though I hope I will soon be able to play. December 2013: All throughout this month my elbow has been feeling stronger. And I would assess it at about 95%. So, yesterday 12/29, I hit tennis balls for an hour. It went better than my last attempt in September, but it was still very noticeable. And afterwards, the elbow is again sore. So, while the elbow feels stronger, I have to say it’s still hanging at 90% functionality. I’ve been doing the Insanity regimen for the past two months as it involves no pulling. Lots of push ups, but these have not bothered me. It’s been allowing me to get a good workout without having to do pull ups and curls. January/February 2014: I continued Tyler-twisting away all through January and my elbow improved noticeably. I also began playing a few mixed doubled tennis matches. Not surprisingly, my play was horrible from lack of practice. But the elbow performed fairly well, without pain during and after the matches. Initially there was some stiffness the day after the match. Now, less so. I’ve also begun P90X3 which starts me back with some pull ups and upper body work. I don’t think my arm can yet handle a season of singles tennis, but this is good progress. April 2015: Epilogue: The elbow continued to gradually improve. I played singles tennis seasons in the summer and fall of 2014 without incident. I again played singles tennis this spring 2015 season. For the first time since the tennis elbow appeared, I played through a season without elbow pain AND my arm felt very strong. I played confidently, swinging away. I also placed first in my singles division. I stayed with P90X3 in the summer/fall of 2014 and did another round of Insanity that same winter. For 2015, I’ve been doing something completely different: swinging a kettlebell. Swinging that bell has done quite a lot to strengthen my forearms. It’s benefited my entire body, really. But since this post is about tennis elbow, I think I’ll weigh in that with the right weight bell and a uninjured elbow, swinging a kettlebell seems a great way to strengthen one’s body and perhaps avoid tendon-related unhappiness. This entry was posted in Round 8, Tai Cheng and tagged acupuncture, cupping, Foam Roller, Lateral Epicondylitis, Pain, Physical Therapy, Rehab, Tai Cheng, Tennis Elbow, Thera-Band Flexbar, Tim Tyler, Tyler Twist, Video. Bookmark the permalink. My doctor recommended a golf ball muscle roller for my tennis elbow, great tool for massaging, worked very surprisingly well helped and me recover faster than any other treatment! trust me your going to want to check it out!! Thank you, Felipe. This is very helpful. The action involved in the stretch is not unlike the Flexbar solution. bought the green bar but have lots of pain just squeezing it(or making a fist in the fist place). should i opt dor a yellow or red? Lots of pain isn’t good. I would definitely go to a lighter resistance bar!